What do I mean by the Knowledge Scape? In the industrial age, business was primarily based in physical locations or ‘places’. In the information age, the work place has been radically altered to reflect very different sorts of interactions in time and space. The catalyst for this transition to the information age has largely been developments in electronics and telecommunications globally. The rapid rise in computerisation has been aided in recent years by the inclusion of multi-media, increased storage capacity for soft and complex forms of information such as pictures, documents, video and sound, and increased speed of transmission. Knowledge Scape refers to all of the ways in which knowledge is created and used within an organisation. The analogy is to a landscape or soundscape. The Knowledge Scape is a product of the information age. Knowledge Scape is a five-day study that explores the use of information and knowledge assets within an organisation. The study can be completed at a corporate or business unit level. At the end of the study you will have a detailed plan that describes short-term actions and longer term initiatives that will deliver measurable improvements in the use of information and knowledge. The study also provides analysis of the four critical areas if information and knowledge are going to deliver substantial business benefits. Finally the study looks at the underlying processes that create and use knowledge or intellectual assets within an organisation. Without this understanding of these processes information and knowledge will remain diffuse – a source of untapped potential. The study is based on a simple but effective model of the Knowledge Scape. I first developed this model in 1995. It has evolved since – from my research into the use of information and knowledge and from the practical experience of applying the model on client engagements. The Knowledge Scape is a dynamic, uncertain landscape. It can be navigated in three simple steps. Understanding and defining the four focus areas in the context of your own organisation’s needs. Understanding the processes that link these four focus areas and deciding where these need to be changed or enhanced. Developing an action plan to help manage the transition from your present position to where you want to be in the future. Their are four main components or focus areas that are used to offer a better understanding of the composition of the Knowledge Scape in your organisation, its structural elements and how they may be used to promote sustainable business advantage. 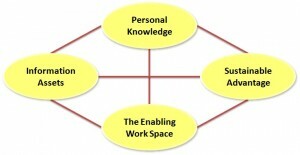 These four areas form the circles in the Knowledge Scape model. From experience, each of these four areas is a vital part of the overall picture. To ignore one of them would mean an incomplete understanding of the corporate Knowledge Scape. Experience also shows that each of these areas is critical when devising information or knowledge strategy and consequent action plans. Without including all four areas plans tend to be short-term in outlook, with disappointing returns relative to investment. What do people in the organisation know? Who knows that they know? Where did they gain this knowledge? How is their knowledge applied for business advantage? How can the organisation learn from this knowledge? Should any personal knowledge be transformed into a corporate asset? Much of the knowledge that is applied within an organisation is actually Personal Knowledge. In other words, it is the expertise and experience that an individual has acquired and which they are able to apply to business work contexts. The module dealing with Personal Knowledge looks at the knowledge held by individuals who make up the organisation. If someone leaves the organisation or moves into a different department, then the knowledge available to that organisation or department will change. It is important for an organisation to understand the types of personal knowledge that are being used and the impact of changing this knowledge, for example through training, work experience, or organisational development programs. Organisations are often not aware of the degree to which personal knowledge contributes to the effective operation of their business. 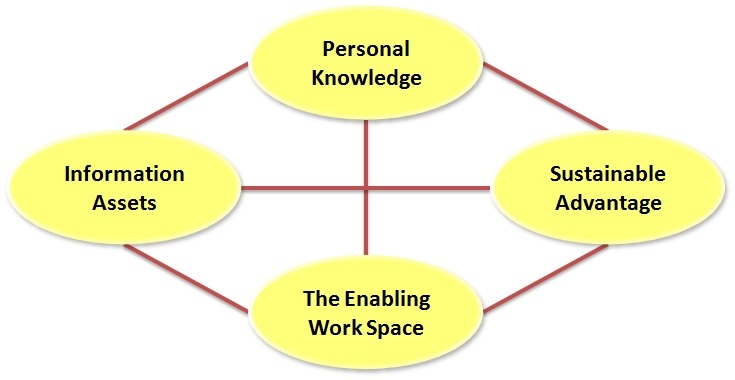 The Knowledge Scape model helps to identify the types of personal knowledge that are available to an organisation, how they are currently deployed, and the potential for using personal knowledge in more effective ways. This module explores the question “what do you know”, and by extension, “what don’t you know” and “what didn’t they tell you” (something that might jokingly be called Ignorance Management). What types of information asset does the organisation own? How are these corporate assets used? What does the organisation do to gain maximum advantage from these assets? Who knows what information is available? Who is responsible for managing the information assets? How can information assets be used to create new products or services? The Information Asset module looks at information and knowledge from a corporate perspective. Information Assets are resources that could be owned at a corporate level. They include information that is stored in information systems and databases, as well as materials that are stored in filing cabinets or paper documents. Examples of information assets include data, patents, copyrights, business processes, information systems or product and service brands. Once again, many organisations do not have a clear picture of all of the intellectual assets that they own. This is particularly true of informations sytems that are poorly documented or information assets that are not managed using a formal or rigorous method. The Knowledge Scape model helps to identify the types of information asset that are available to an organisation, how they are currently deployed, and the potential for using information assets in more effective ways. The module dealing with Information Assets contains checklists that are used to identify and complete an inventory of the tangible assets in an organisation. The module also uses a Life Cycle of Intellectual Assets to help determine the relative value of the various information assets owned by an organisation. I believe that an organisation limits itself through its capacity to utilise its information assets effectively. To this end, this focus area explores how to improve the effective use of information assets, both with and without computers. Does the organisation gain advantage from knowledge and intellectual assets? Could knowledge and information have a greater impact? How do we create unique, advantage-sustaining intellectual assets? The contribution of knowledge to performance? The Ratio of Information to Infrastructure? Sustainable business advantage is the end-goal. Without gaining some business advantages from knowledge, then personal knowledge and information assets have no validity. Many organisations do not measure the contribution of knowledge or information to business success. This module develops measurements of effectiveness for an organisation in the information age, including the use and handling of information. This is in turn related to how the organisation develops or transforms over time, how it perpetuates itself, and how it can simultaneously improves its position. I explore the relationship between information assets and the ways in which an organisation is organised! How does an organisation invest in its own future? In what ways can improvements in organising information assets contribute to improvements in the organisation’s ability to organise itself. What is the culture and working environment in the organisation? What support is available from information technology? What factors inhibit the use of knowledge and information? How are people rewarded for using information or creating knowledge? What is the awareness of the value of knowledge and information assets? Do people know about knowledge or information management theory and practice? Is the work space conducive to the use of personal knowledge? How can the work space be optimised for the effective use of corporate information? Information and knowledge count for little if the work environment to help use this resource is missing. This module looks at the pre-requisites or foundations for effective use of information assets and personal knowledge. Part of this unit examines information politics within the organisation. Information Politics can be a constructive “discipline that enables the transformation of the workplace from excessive managerial co-ordination to widespread empowerment of customers, suppliers and producers of services” [Paul Strassmann]. This component improves or expands that which individuals and groups can accomplish. I also analyse the balance between management practice and the design of information systems. The sub-title – From Muddles to Models – suggests that without some ideas and guidance we end up in a muddle and become more ignorant instead of more knowledgeable. Instead, I propose the use of various forms of models – intellectual representations of the Knowledge Scape – that can be used to create sustainable business advantage. My methodology explores the processes and interactions between the four main focus areas and provides a way of introducing more effective management of the Knowledge Scape within an organisation. The key processes are the links between the four components that constitute the Knowledge Scape. These processes add a dynamic aspect to the more structural elements. The key processes listed below are not so amenable to easy definition as those say, of a manufacturing operation or an industrial economy. Attempts to manage, control or define these processes should use a combination of conventional approachs combined with the skills of improvisation, innovation and creativity. When organisations examine the six sets of processes that operate between the four components of the Knowledge Scape, they ensure that their more qualitative aspects are not overlooked.